Beachcomber Cottage in Marazion sleeps 4 people. 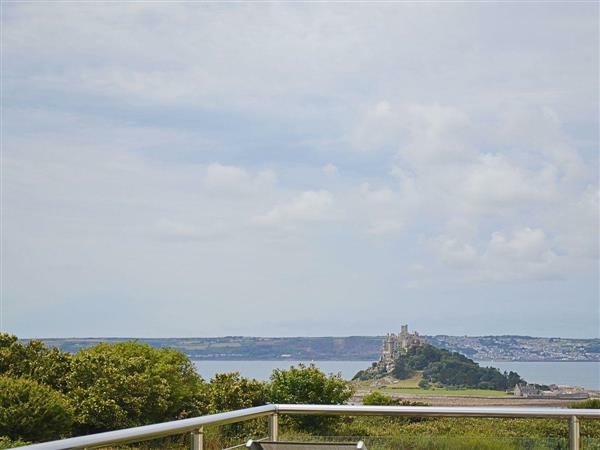 This delightful upside down holiday property presented to a very good standard, is peacefully located with breathtaking views to St Michael’s Mount, one of Cornwall’s most famous landmarks, now owned by the National Trust. Access is by ferry crossing, or on foot across the causeway at low tide. Marazion’s beach is ideal for families, sailing, windsurfers and watersports. Marazion and Penzance are steeped in history with art galleries and museums. Land’s End, Mousehole, Newlyn and St Ives within a short drive. Shop and pub 1/4 mile. Ground floor: Utility room. 2 bedrooms: 1 double, 1 bunk, both with wooden floors. Bathroom with shower over spa bath and toilet. Open tread spiral stairs to first floor: Living/dining room. Kitchen. Wooden floors throughout. Underfloor heating (in bathroom), Economy 7 Night Storage Heating, electric, bed linen and towels included. Satellite TV. DVD. CD. Electric cooker. Combi m/wave/oven/grill. Washer/dryer. Dish washer. Freezer. Small enclosed garden with patio. Balcony. Barbeque. Parking (2 cars). Hot tub. No smoking please. Holidays at Beachcomber Cottage run from Saturday to Saturday. Beachcomber Cottage is in Cornwall; should you be on the lookout for a special offer, you can find all the special offers in Cornwall. It's always worth checking to see what is on offer at the moment. Do you want to holiday near Beachcomber Cottage (24861), you can see other cottages within 25 miles of Beachcomber Cottage; have a look to find your perfect holiday location.